Ten Eleven members of Heps Nation will be heading off to College Station, Texas, next week for the 2017 NCAA Indoor Track & Field Championships. Accepted/declared athletes were announced by the NCAA last night. The Harvard women will be sending four athletes, one of the highest representations for the school in years. The Crimson never had more than two top-eight performances at a NCAA indoor championships. Sophomore Gabrielle Thomas and freshman Judy Pendergast are entering their first NCAA indoor championships ranked sixth and eighth in the 200-meter dash and 5,000-meter run, respectively. Senior Nikki Okwelogu is looking for her third consecutive top eight finish in the shot put (she goes in ranked 16th) and first-year Zoe Hughes is one of two freshmen who will be competing in the NCAA pentathlon (she is ranked 13th). Princeton senior Allison Harris will be traveling to a NCAA championships for the first time. The conference record she set earlier in February — 4.27 meters (14-0) — has her in a three-way tie for 10th in the seeding. 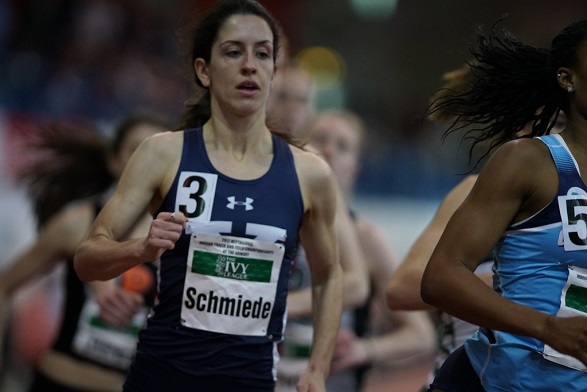 Yale senior Frances Schmiede will be competing in the NCAA’s mile for the second straight year. Last year, she finished seventh in her preliminary heat and did not advance to the final. She will be going to Texas as the 10th seed. Cornell senior Rudy Winkler and Princeton sophomore Adam Kelly will compete against each one another again on the national stage (they previously did so last year in the NCAA Outdoor Championship hammer finals). Winkler is the third seed in the weight throw, while Kelly’s personal best from Indoor Heps last weekend seeds him seventh. Cornell senior Austin Jamerson’s performance from Indoor Heps last weekend — his first full heptathlon of the 2017 indoor season — was enough to punch his ticket for NCAAs. His conference record mark of 5,756 points makes him as the 12th seed. The final Heps Nation athletes going to NCAAs are not undergraduates, but a graduate students. Ned Willig (Brown ’16) will represent Michigan in the mile. Earlier this year, he had his first ever sub-4 minute performance (3:58.09) at the BU Terrier Invitational. He was joined in that race with his teammate Will Sheeran, who like Willig graduated from Brown and is finishing his eligibility at Michigan. Sheeran ran 3:59.15 in that race and was on the bubble of making the NCAAs, but the cutoff time was 3:58.75. Meanwhile, Tim Gorman (Dartmouth-Oregon) was accepted into the mile final field on Friday afternoon. He was the first man out with his 3:58.78 time that he ran at the Husky Classic when the initial declarations were announced on Tuesday. The NCAA Indoor Track & Field Championships will be held on March 10 and 11. Full accepted entries can be found here (women) and here (men). This entry was posted on Wednesday, March 1st, 2017 at 9:28 am. It is filed under Athletes, Spotlight. You can follow any responses to this entry through the RSS 2.0 feed.